This Skillet Jalapeno Cheddar Cornbread has jalapenos for a spicy kick, Mexican style corn with bell peppers for extra flavor and shredded cheddar for that ooey-gooey cheesiness we all desire. 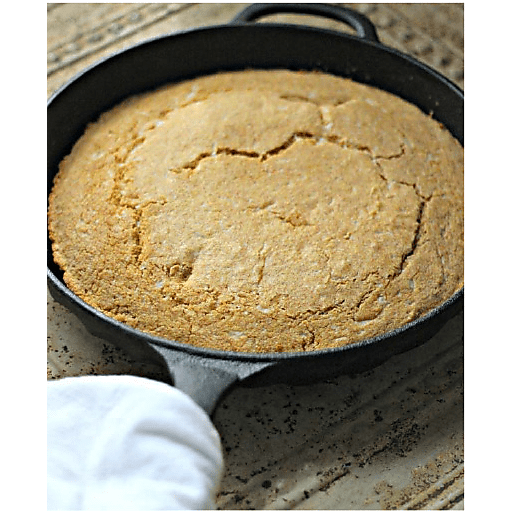 We swapped all-purpose flour for white whole wheat flour to give us the texture of traditional cornbread, but with a little extra fiber. We are cooking all of this goodness in a cast iron skillet to give the cornbread a crispy crust. Serve by itself or with a hearty bowl of chili! 1. Preheat oven to 425°F. In a medium bowl, whisk together dry ingredients (through coarse salt). In a separate small bowl, whisk together wet ingredients (egg through oil). 1. Combine dry and wet ingredients, until incorporated. Stir in corn, jalapeño peppers and cheese. 1. Heat cast iron skillet on medium-high on the stove. Melt butter and spread to evenly coat the pan. Pour cornbread batter in to the pan, then transfer to the oven. Bake for 13-17 minutes, until toothpick in the center comes out clean. Use 1 ¾ cup low fat milk + 1 Tbsp. white vinegar instead of low fat buttermilk. Calories 220, Total Fat 6g (Saturated 2g, Trans 0g), Cholesterol 25mg, Sodium 560mg, Total Carbohydrate 34g (Dietary Fiber 3g, Sugars 8g), Protein 7g, Vitamin A 4%, Vitamin C 8%, Calcium 15%, Iron 8% *Nutritional values are an approximation. Actual nutritional values may vary due to preparation techniques, variations related to suppliers, regional and seasonal differences, or rounding.